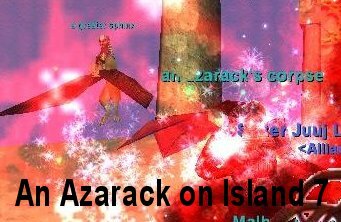 Since about May 2006, Azarack pathing has been bad -- they have been spotted (and engaged in combat on) Islands 1.5, 5, 7 and 8. See pics below. This has led to AGGROING THE SPIROC LORD on at least islands 1.5 and 2!!!!! 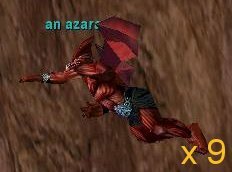 My best advice: Do not engage any Azaracks when you are within a 1000' radius (that's the range of Cazic-Touch) of The Spiroc Lord (see the Map). This means MEZZING them if possible if you see them on 1.5 and ONLY fighting Azaracks on the EAST side of their own island, etc. Also, keep Azaracks ROOTED during battles to keep their pathing issues to a minimum. I'd welcome any reports on whether this helps. When this situation changes, this header will change. The Wayfarers of Veeshan recently underwent various Plane of Sky raids and found that the information on Plane of Sky was various, conflicting, dispersed but often just not found. As such, I took it upon myself to consolidate and verify information during those raids. This page is an attempt to be an "all-in-one" guide to the Plane of Sky. If any information in this page is speculative or based upon a rumor, it has been labeled as such. It is my hope that this page can answer every question for the future about this fascinating zone. Corrections and additions are most welcome! Added note regarding Z coordinate of 1.5 falling outside the normal "key progression" pattern. Confirmed that Protector of Sky is now spawned by clearing Island 2, with no particular placeholder. 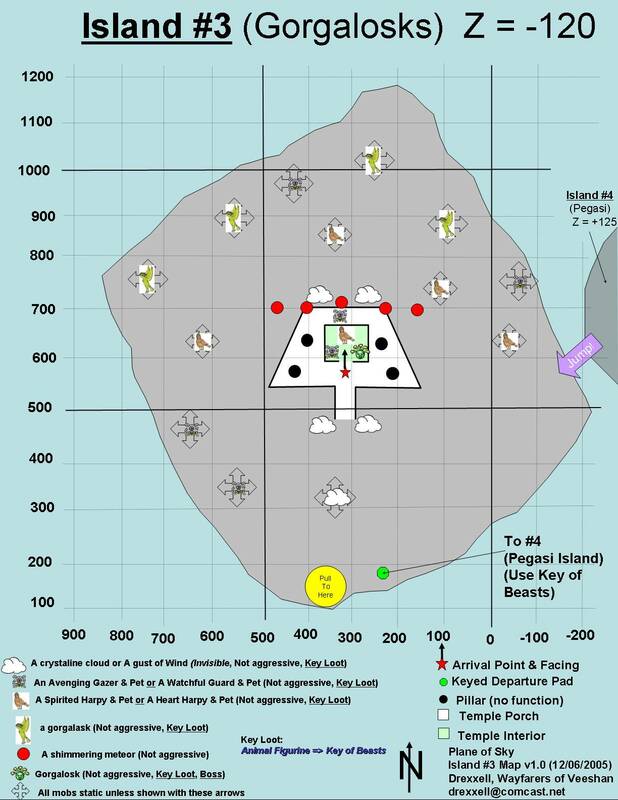 confirmed safeness of the arrival point on Island 2, though pathing mobs remain KoS and nearby. Added full set of conversational text with Sirran for islands 1-6 (incomplete for 7), and expanded Sirran section significantly. Added aggro and combat information on Hand of Veeshan. Added picture of Hand of Veeshan. Added confirmation of pull-jumping helping start the Keeper of Souls timer. 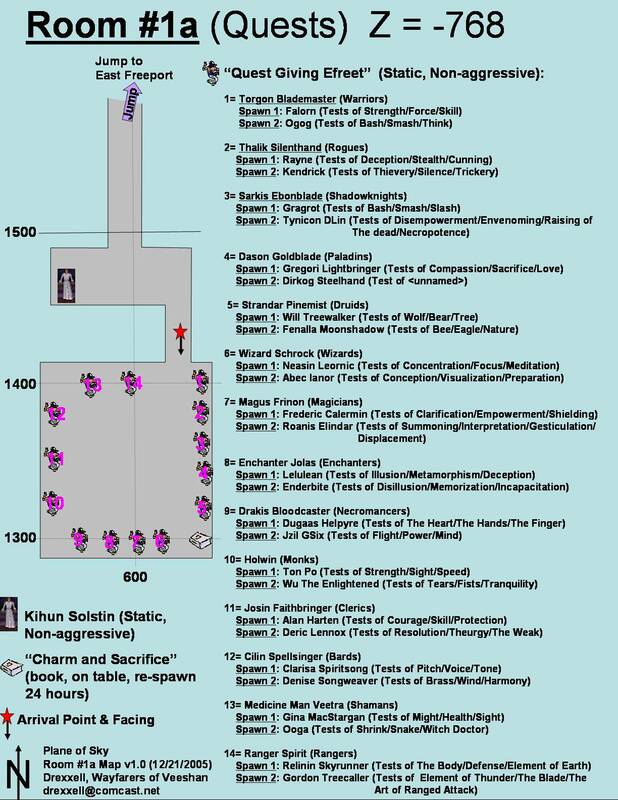 Added lots of interesting information about Ekim Nottap's location and relationship to the Keeper of Souls. Confirmed multiple Overseers of Air, and info about using them to spawn the Hand of Veeshan. Added combat information for island 1.5. 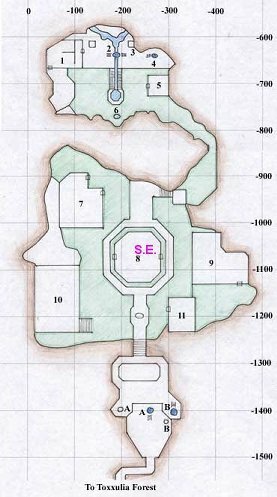 Added information about the aggro-relationship between the Sister of the Spire, the drakes, the sphinxes and Sirran on Island 7. 2006 Jun 16 - Added link to "Am I one with the wall?" page, and cleaned up all references to these words throughout this guide. Added better pictures of Hand of Veeshan and an animated GIF of him flying about. The Plane of Sky is a strange, beautiful and altogether fascinating place. It is, in many ways, its own little world. There are many reasons to go there, not the least of which is simply the challenge of "defeating" the plane. Many epic quests require a trip here (the Necromancer Epic requires two separate trips!). The following information is important for all players to read, and know, before planning a trip to the Plane of Sky. Call of the Hero (Note that a Necro-CoH can be done. See here for details. 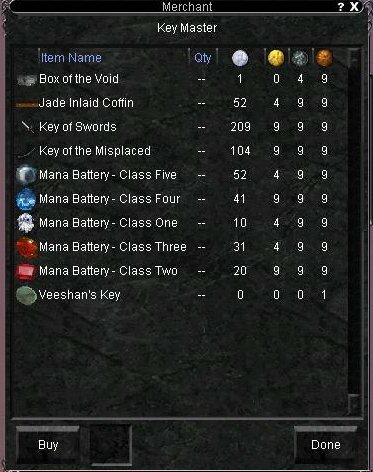 Note that the Key Master (vendor) does not sell "tiny jade inlaid coffins"). 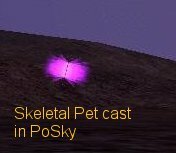 The only mage pet castable in Plane of Sky itself is an "Air Pet". The graphic for this will look like a Sister of the Spire or Storm Mistress, not like a regular air pet. Any mage pet can be brought up with the caster though, and will retain it's normal look. There has been a long-standing rumor that doing these things in this zone is unsafe. This seems to be based upon some prior (now gone) sensitivity of Sirran the Lunatic (see below under "Sirran the Lunatic") to certain actions/words. For now, no Hail, Shout, OOC, Auction, Emote or Say (aside from the conversation with Gorgalosk, see Island 3) has been seen to cause any danger. Have a wizard of 46th level or higher take you. The spell needed is "Alter Plane: Sky", and requires the use of one "Cloudy Stone of Veeshan." Have a wizard who has an Amulet of Planar Transference (Name changed to "Amulet of the Void" sometime between 2001 and 2005) use it to take you to Sky. RUMOR Use the portal located deep inside Veeshan's Peak. (In Phara Dar's room. However you need really high faction to get into her room, like max ally, and of course the key to Veashan's Peak.) [This was changed to RUMOR status on 4/10/2006 by Slavetrader: "Slavetrader tells you, 'Ah ok.. tried them all.. mostly sent me back out to skyfire.. i think druushk's was the one that did freeport.. but i made sure phara dar's didn't as well.. kind of a bummer'] "
Note, there was a 3rd merchant during the Froglok occupation of Gukta/Grobb named "Scribe Zibby", but upon the Troll re-taking of Gukta this merchant was not re-located to the Rathe Mountains with the rest of the Froglok population and is assumed dead and gone. The wizard casting the spell must be in the group of players who wish to be taken to Plane of Sky. Therefore, if you're trying to get a raid party up to this plane, you'll only be able to come 5 at a time. There is a RUMOR that an NPC will send you to the Plane of Sky if you give them the stone. 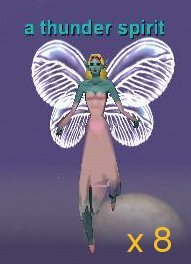 This rumor is probably based on the FACT that such an NPC (Relm M'Loch in Plane of Tranquility) was introduced for the Plane of Hate in 2005. However, no such NPC for the Plane of Sky has been found as of 11/28/2005. The Plane of Sky is a vast void of emptiness (a "sky") filled with a few floating rocky islands. It is upon these islands that actual hunting takes place. A few of the islands are connected by giant chains, and some of the islands have a chain simply dangling straight down. These chains give the impression that the islands were all "linked together" at one time, but perhaps time and decay have deterioriated them. See the picture at right. Each island is unique in its size, monsters and treasure. Also, for the most part, traveling between islands is done in a very fixed order using a series of keys (more on that later). 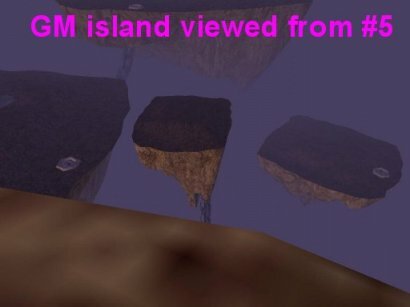 Because of this, the islands are often given a specific number (their key order) or nickname (based on the monsters on the island) in many online write-ups. A similar format has been followed here, though with an acknowledgement of the variety of nicknames and numbering schemes used over the years. As far as can be determined, every island except one is solid, and the actual playing of EQ takes place on the top surface of the islands. Island #1 has a hollowed out room below the surface of the island itself. More on that in the description of Island #1 and Room #1a. There are three windmills in the Plane of Sky (Islands 1.5, 4 and 8). 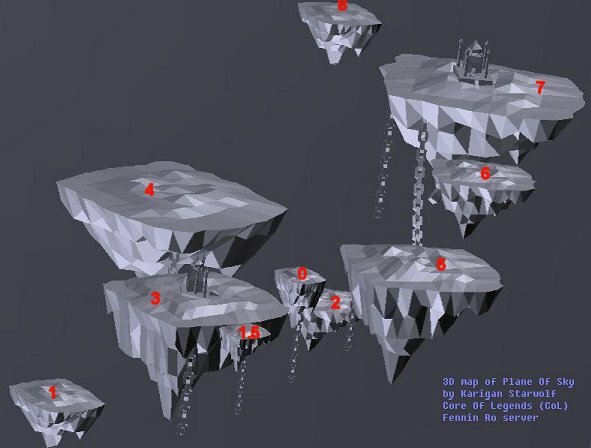 Oddly enough, these are also exactly the same islands which are part of the Hand of Veeshan spawn-cycle (Kill Noble Dojorn on 1.5 to spawn Overseer of Air on 4; Kill Overseer of Air on Island 4 to spawn The Hand of Veeshan on 8). The windmills have two moving components. The first are the actual windmill blades themselves which may or may not be spinning at any given time. If left to their own devices, the pattern of whether or not any given windmill's blades are spinning has not yet been determinable. The second moving component is the vertical axle inside the windmill. In all cases observed thus far, if left to their own devices, the vertical axle will always be spinning. There has not been any observed correlation between motion of the blades and motion of the axle. It just so happens that both the blades and the axle are clickable. In the case of the blades, you have to be able to reach them (which isn't always possible). In the case of the axles, they are easily reachable by anyone. If you click an axle, it will stop spinning for about 22 seconds, and then start again. If, by chance, you manage to click on the blades of a windmill, they will stop for a length of time that exceeds a few minutes (exact time has not yet been determined). What is the point of all this? Unknown. Clicking either the axle or the blades of a windmill seems to have no function besides stopping the motion. Although the windmills are on the same islands as The Hand of Veeshan spawn-cycle, and the mobs in that spawn cycle appear at the doorways of their respective windmills, no further connection is known. Is there more to this, or are the blades and axles simply put in there for our amusement? Any confirmed information is welcome. You will zone out of Plane of Sky, splashing into the waters a few hundred feet off the east coast of East Freeport. This is a non-damaging fall, and aside from the fear of drowning and perhaps the rare shark, is perfectly safe. Until the "camp-and-go-home" option was installed in EQ in 2005 this was, in fact, the only way to leave the Plane of Sky at all for many years! Using the chains: they connect the underbellies of a few islands, and since there is no way to climb up the underbellies to reach the upper surface of the islands, getting onto the chains is a dead-end. FALSE RUMOR:There was a bug that if you rode off an island on a horse you would fall to Island 1. That bug has been fixed. [Confirmed 12/21/2005], and this now falls into "false rumor" category. RUMOR: It has been rumored that if you ride a horse and use the keys to telepad from island 1.5 to 2 that you will fall to your death. Any confirmation of this rumor would be welcome. 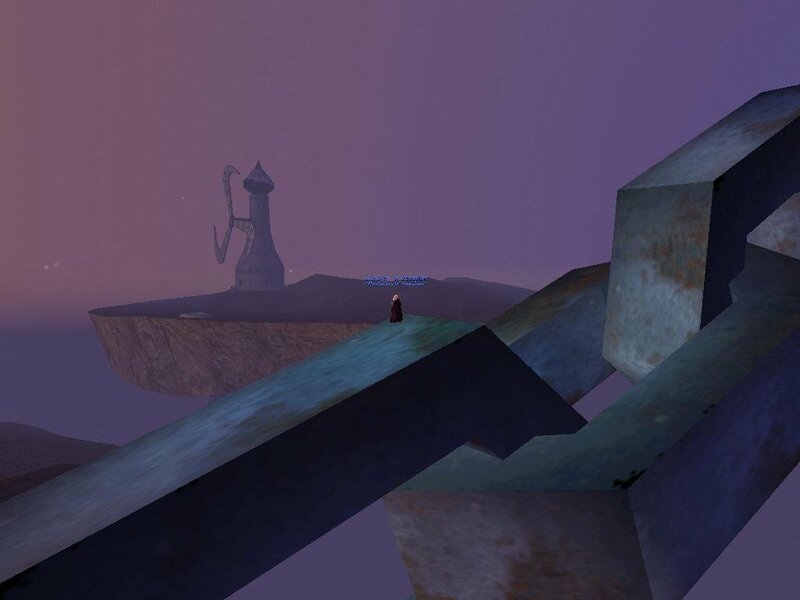 Jump off (thus zoning into East Freeport) and have a Wizard return you to Plane of Sky. This is a way to get back to Island #1; however, see the precautions on "going over the edge of an island" above. Have a necromancer perform a "necro-CoH" upon you. Use this link to see how to do this. Intentionally jump from a higher island to a lower neighboring island. This is very difficult and dangerous. There are only a few possible paths for jumping. (4 to 3; 4 to 2; 7 to 2; 6 to 5). (see below). 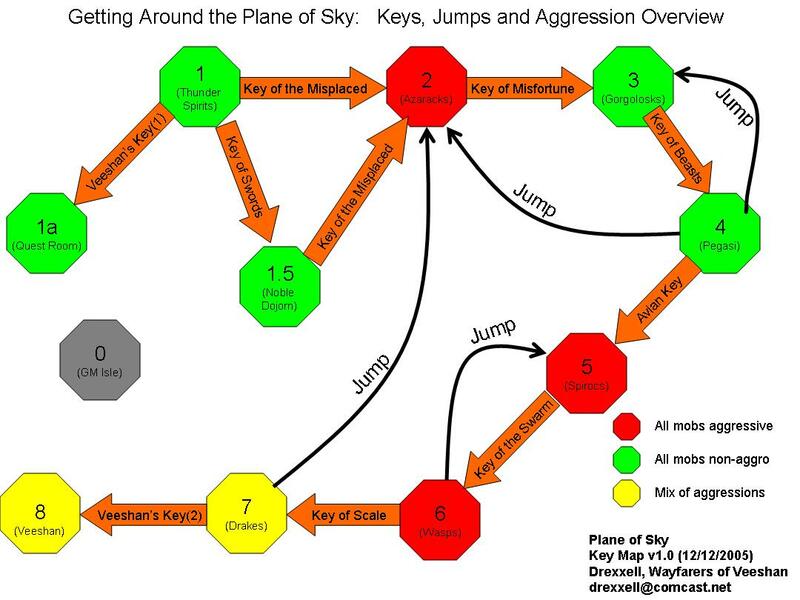 Use the Plane of Sky Keys (see below). Because these last two options are complicated, they will be explained in their own sections, below. Find below an overview map of the Plane of Sky. 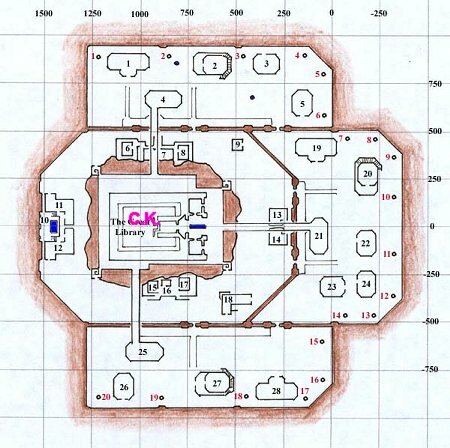 There is reference to jumps and keys on the map, both of which are described below. Also later on this page will be an island-by-island breakdown, with a close-up map of each island as we go. An old one-liner about skydivers goes: "Why would anyone want to jump out of a perfectly good airplane?". Truer words could hardly be spoken about those intrepid fools known as island-jumpers. It can only be done from a higher (3rd, or Z- coordinate, in LOC) island to another. Because the key-order of the islands corresponds to increasing Z-coordinates (except for Island 1.5, which falls, key-wise between Islands 1 and 2, but falls Z-wise between Islands 3 and 4), this can only be done to move backwards relative to the key order. (Which, by the way, is the only way to move backwards, short of jumping and returning to Island 1). Without Safefall, Harmshield, Invulnerability or other protection the fall will yield 20,000 hp of damage which will generally kill you. There's a good chance you'll miss the lower island and zone out until you learn exactly where to jump, with what speed and in what direction. It's a heck of a lot easier to jump off the zone entirely, port back up to Island 1, go invisible, and make your way forward with the keys. Each of the four potential jumps for this zone are outlined below. CLICK HERE for an animated view of the jump from 4 to 3. Issues: If you've made enemies of the mobs on Island 3 and left any alive, you may survive your fall only to find yourself under immediate attack. Issues: Although the mobs on Island 2 (Azaracks) are aggressive, I've jumped to #2 and run fully across the island with Harmshield up, managing to key myself to Island 3 before being attacked at all. Issues: Because the mobs on Island 5 are all aggressive, anything alive on that island will attack if you are visible when you land. Specifically the Cazic-Touch of the Spiroc Lord will go through Harmshield!!! 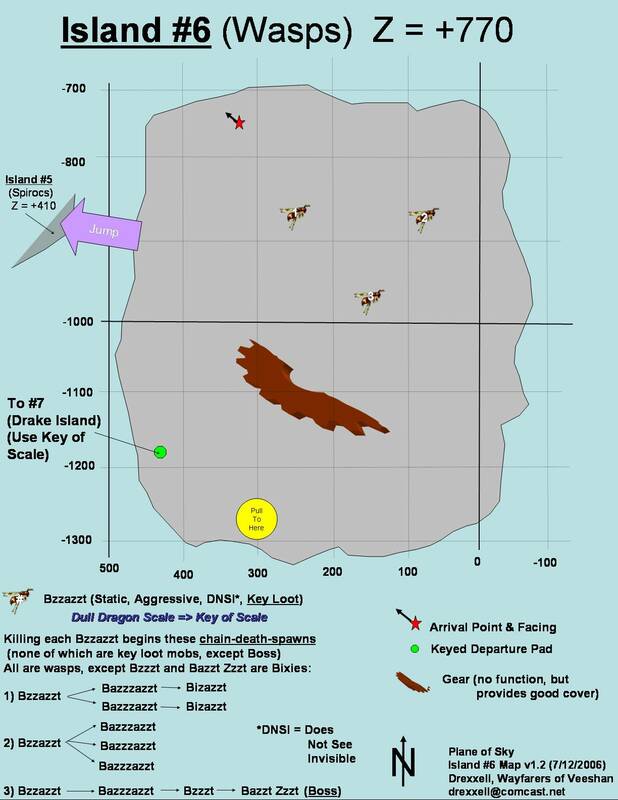 The following table shows the research performed to confirm the various island-to-island jumps possible in this zone. Successful hits are highlit in yellow. 4 2 Gnome SoW, unencumbered 50 feet Harmshield STILL Missed island!! 4 3 Gnome Normal, unencumbered 50 feet Harmshield Hit island safely! Go to the appropriate "telepad" on the island (see image to the right). They are not Temporary (NORENT) as of 2004. (Max # Possible per Raid) Identifies as... If available from Key Master, how much is it? NOTE: You must get this key from Island 1!!! 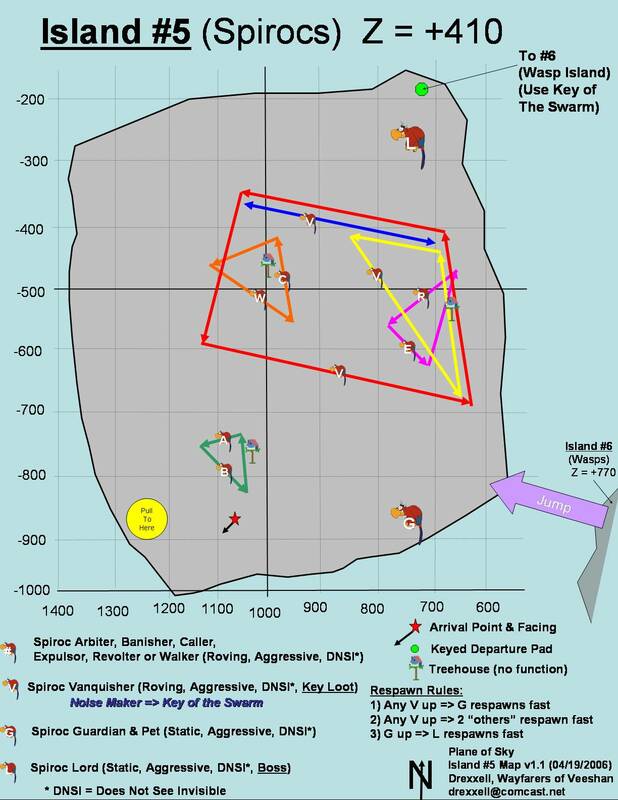 The following graphic shows a basic overview of how to get around, and what sort of aggression to expect when you arrive. On Island #1 there are 3 keys and 3 telepads. All three keys may be bought from the Key Master. One of them, in fact (Veeshan's Key) must be bought from him. 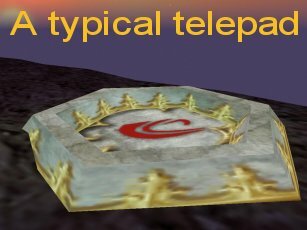 All other islands have but one telepad. (Island 8, being the final island, has no telepads. Island 0, having no player access, also has no telepads). The Boss Mob isn't always up. Under each island's description (below) is a discussion on how to get the Boss Mob to spawn. Island 1.5 (Noble Dojorn) used to be a one-way trip. That is, there used to not be a telepad on the island. That was changed and there is now a telepad from 1.5 to Island 2. As such, while Island 1.5 can be done as part of the "key order" it is skippable by just going from Island 1 to 2. 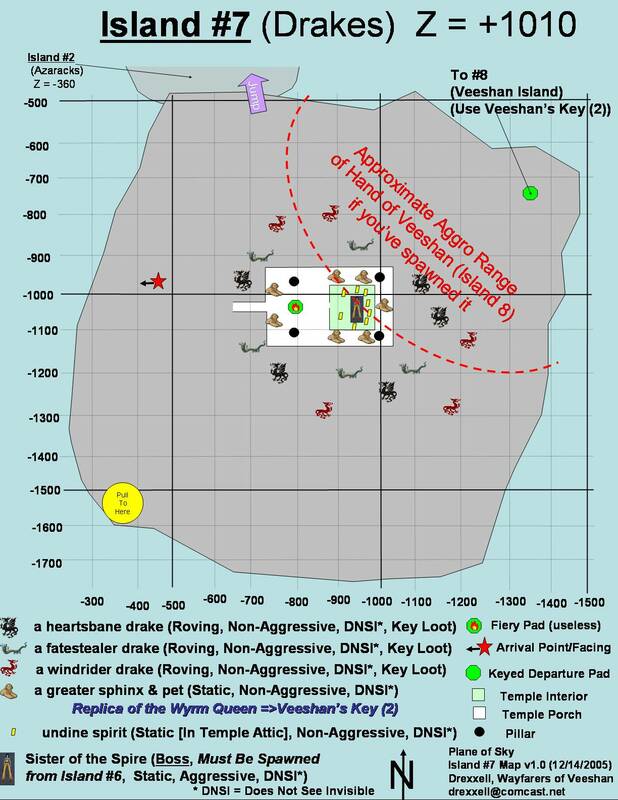 However, you should note that the key needed is acquirable only on Island 1! 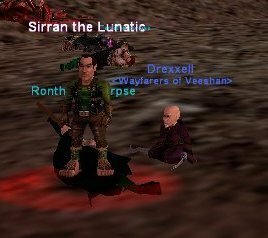 Sirran the Lunatic will assist any living aggressive mob on the island you are on! As such, it is wisest not to kill the Boss (and thus spawning Sirran) until all other aggressive mobs on the island are dead or far removed. See below for more on Sirran The Lunatic. A lot has been and can be said about Sirran, but here are the basic facts as confirmed by direct evidence. He de-spawns on a 20-23 minute schedule. He is non-aggressive, in general. He will assist any aggressive mob that attacks you. Handing him the "Key Loot" from the island you are on will get you back the Key to the next island. NOTE: Each Island's "Sirran the Lunatic" is different than the others. As a specific example, you can not hand the Key Loot from Island 6 to the Sirran the Lunatic spawned on Island 1!!! While he won't attack you for doing so he also will simply refuse to accept it. The only trade Sirran will accept is the Key Loot for the island on which you spawned him. RUMOR Hailing Sirran will re-set his de-spawn timer. This is a "maybe". Confirmed (by me) that this does NOT work on a 5 minute re-hail interval on island 6. However, for the same island, have reports that it does work on a 45 second re-hail interval. Sirran will have various conversations with you island by island. Because Sirran's conversations seem to flow together, I've put them all here, rather than on their individual islands. However, before going through his non-aggressive text, let's see what Sirran has to say if he's ever irritated into attacking. (See the Am I one with the wall? page for notes about what Sirran's words mean here. Island 6 is special. Sirran behaves in an even more radical fashion than usual, and of special note, dealing with him appropriately is required to get the Boss of Island 7 to spawn (which, obviously, then means that getting the key from 7 to 8 requires dealing with Sirran properly here on 6). For a complete analysis of why you are to have the conversations (below), please see my "Am I one with the wall?" page. Reversed: "Hail, Sirran the Lunatic"
Reversed: Greetings. Allow me to introduce myself. I am marshal Sirran, Marshal of the great wall patrol." Translation: see my "Am I one with the wall?" page. Reversed: "Am I one with the wall?" Translation: By saying "?llaw eht htiw eno I ma" to Sirran, you have just spawned "Sister of the Spire" on Island 7. RUMOR: It is rumored that the phrase ".citanuL eht narriS ,liaH" is used to keep Sirran from de-spawning on this island, if someone is camping the Sister of the Spire on the next island. I can confirm that it fails to work if you re-hail Sirran every 5 minutes. However, I have a report that it succeeds on a 45 second schedule. I need to test this. What happens if you kill him? Multiple people have emailed me to state that you take a permanent "Denizens of Sky" faction hit, and will be KoS after killing Sirran once. Others have stated that it takes multiple kills of Sirran for this to happen. What happens if you spawn him on an island before he's de-spawned on the previous island? Again, multiple people with conflicting stories have submitted information on this. On the one hand, people say two Sirrans can't be up in Sky. On the other hand, there are multiple stories of "Farming the Sister of the Spire", which requires keeping the island 6 Sirran from despawning while repeatedly killing the Sister of the Spire on 7 (and spawning Sirran up there). Considering that each island's Sirran is quite different than the others, I'm inclined to go with this latter theory, but have not yet tested it. However, there are far more reports of "multiple Sirrans" than denials of it, so I'm inclined to believe that you can have different ones up on each island. As it so happens, the peaceful quest-giving Efreeti in Room #1a will be hit by Area-of-Effect spells cast on the surface of Island #1 and they will rise up to the surface of the Island and attack you! Aside from this strange circumstance, the mobs of Island #1 and Room #1a are totally independent and will be treated as such through the rest of this write-up. ADDTIONALLY: Occasionally, during a duel between 2 players, occurring on Island #1, it has been noticed that direct damage non-AoE spells used by one player upon another sometimes aggro an Efreet in Room #1a. How and why this happens are open questions. To be safest, don't use any spells if you can avoid it during duels on Island #1. As the mobs aren't aggressive, you may simply use your key to telepad to Quest room #1a, Island #1.5 or Island #2. However, since the mobs on Island 2 are aggressive, it's best to go invisible first if telepadding to Island #2. 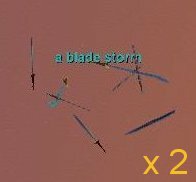 The key loot of interest are called "Lost Rabbit's Foot" and "Miniature Sword" and drop 3 (each) at a time off of "a thunder spirit". As such, 24 total keys (of both types) may be gotten from this island. The assist range of each Thunder Spirit is quite small. 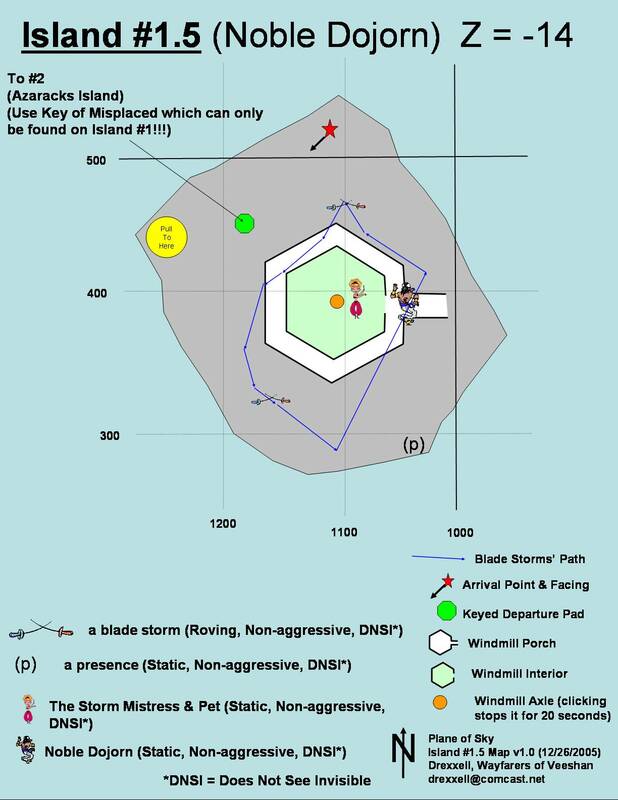 As such, farming keys becomes a simple matter of moving around the perimeter of the island, killing one static Thunder Spirit at a time and looting what is needed. Note that 2 keys are farmed on this island. The first ("Miniature Sword" for "Key of Swords") is to telepad from Island 1 to Island 1.5. 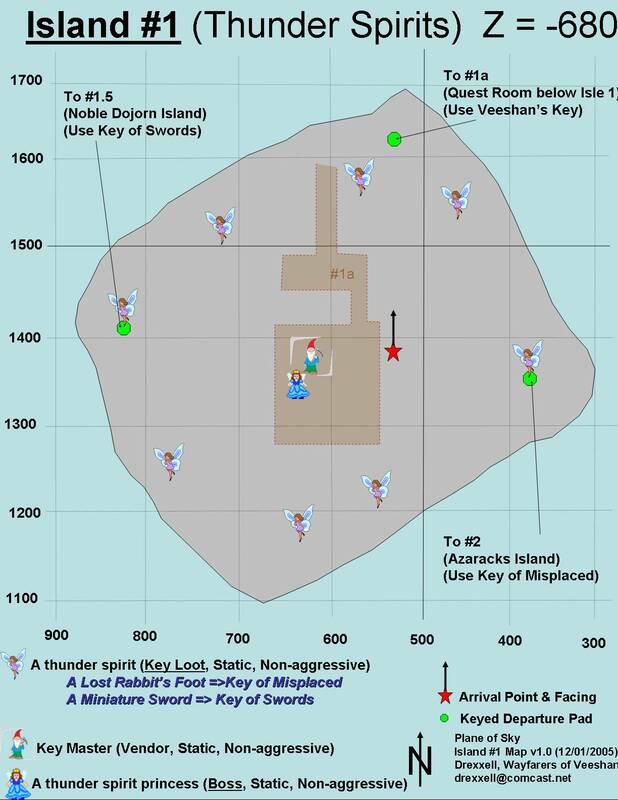 The second ("Lost Rabbit's Foot" for "Key of the Misplaced") is to telepad from Island 1 to Island 2. This is the only island where you farm 2 keys. 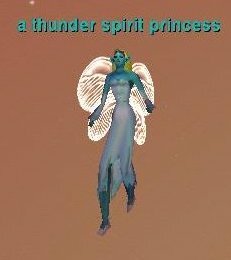 Once you have looted enough "Key Loot", you can simply move on to the thunder spirit princess herself, and kill her to spawn Sirran. This is allowable even if you haven't killed all of the thunder spirits, since they aren't close enough to come help the princess, thus Sirran should see no aggressive mobs to aid when he spawns. 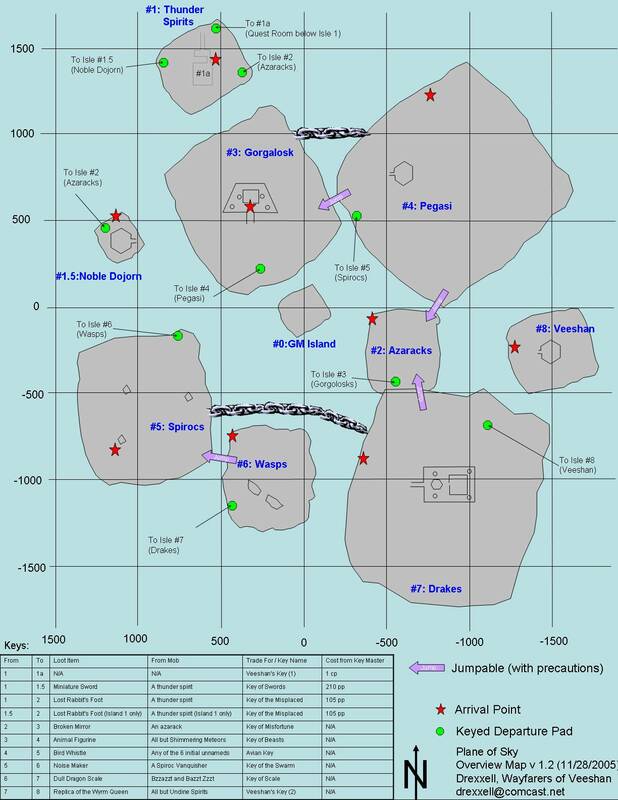 The following information shows you the breakdown of the mobs on this island. The Boss mob is shown in bold. Who is here when you arrive? Name Number Location Aggressive? Assist? See Inviso? Level HP Max Hit Special Abilities Re-spawn time Responds to hails? Key Loot? Who can you spawn / aggro here without leaving this island? Cast an offensive AoE spell on the surface of Island #1 and depending on its radius and where you're standing, you're likely to draw 1 or more Efreeti up from Room #1a to attack. Cast an offensive NON-AoE spell on the surface of Island #1 and sometimes it aggroes an Efreet from Room #1a. How and why this occurs have not been satisfactorily answered, but it is a confirmed occurrence. 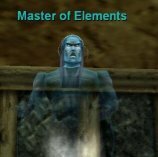 However, it has only been seen during duels used in performing a Necro-CoH. Sirran the Lunatic (Island 1 version) 1 Near corpse of "a thunder spirit princess" No Yes ?? 65 ?? 2054 ?? No Spawn: Kill "a thunder spirit princess"
Who can you spawn here through actions elsewhere? For conversations with Sirran, see above under "Sirran the Lunatic"
This is a 2-room area located inside Island #1, about 90 feet below the surface. Non-aggressive mobs (efreeti) fill the back room, and one non-aggressive human is in the front room. The trip to this quest room is one-way: once you telepad here, your only way out is to jump, unless you've brought a Wizard with you to cast "Alter Plane: Sky", which will work to take you up to the surface of Island 1. Most people visit this room to do turn-ins for Plane of Sky quests. While mostly out-of-date by 2005's standards (the difficulty vs. payoff ratio stinks on most of them), they are still required sub-quests for many classes to complete their epic 1.0 quests. 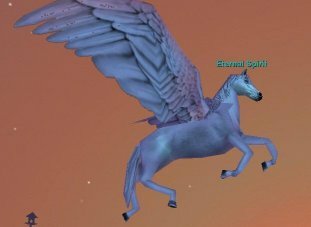 Hail the Efreet, and go through the chat until you have to pick one quest giver or the other. When you make your choice, the Efreet hands you a book written by/about said quest-giver. Hand the book back to the Efreet. The Efreet will spawn the quest-giver you have chosen. In all but 3 cases, the Efreet will now de-spawn for 3 hours. Hail the quest-giver and go through the chat to pick one of their "tests". The quest-giver tells you to collect 3 items (all found in Plane of Sky) and to return them. If you're unfamiliar with the quests, you'll have to go through the above mechanism to learn what the quest items are, even without any notice of what reward you will get. Collect the three items, return to the quest room, go through the same process of spawning the quest-giver, and turn in the items for your reward. A word about the text in the quests: I found that many of the Efreet and the quest-givers are highly sensitive to the exact wording needed to go through the motions of giving the quest. Further guides may include this information, but basically some carefully worded responses will get the right results. Although it's not recommended, one can take on the efreeti in this room for XP, but they will yield no lootable items. They assist one another, so unless you want to take on 14 at a time, you'll want to either have crowd control or else de-spawn some of them. You can de-spawn the efreeti by hailing them and going through the motions of having them spawn their "quest givers". Aside from 3 of them, the efreeti will all de-spawn themselves after spawning their quest giver, and their quest givers will despawn themselves after about 10 minutes. This is a nice way to clear the room down to a manageble size. The three efreeti who don't despawn after summoning one of their quest givers WILL despawn after they summon BOTH of their quest givers though. The following information shows you the breakdown of the mobs on this island. There is no "Boss" of the Quest Room. Name Number Location Aggressive? Assist? See Inviso? Level HP Max Hit Special Abilities What quests? Who can you spawn / aggro here without leaving this room? Master of Elements 1 Center of back room No ?? ?? 63 ?? ?? ?? Say to Kihun Solstin "I want to see the Master"
Peaceful, tiny island, rarely visited. Originally a one-way trip from Island #1, this island had a telepad installed around 2003 which leads to Island #2. Thus, because it can be done between islands #1 and #2 (but is not required) it is given #1.5. There are few reasons to visit this island. The first is for monks to kill Gwan for their epic. Another is to kill Noble Dojorn, which is the first mob kill necessary for spawning the Hand of Veeshan. Finally, some people visit just to kill the mobs for a sake of completeness. An interesting note -- All accessable islands, from 1 through 8, have an increasing "Z value", except this one. The Z coordinate of this island (Z= -14) falls between those of islands 3 (Z= -120) and 4 (Z= +125), even though it falls between islands 1 and 2 in "Key progression". Whether or not this is relevant has not been determined. As the mobs aren't aggressive, you may simply use your key to telepad to Island #2. (Of course if that's the case, you should've just gone to #2 from #1 directly without coming here.) However, since the mobs on Island 2 are aggressive, it's best to go invisible first if telepadding to Island #2. 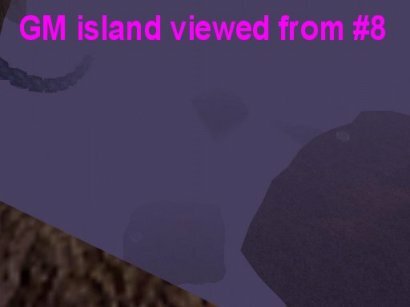 No "Key Loot Mobs" are found on this island. The key from island #1.5 to #2 is the same as from #1 to #2 and is only acquired on island #1. Thus if you've come here without the key to #2, you're stuck. Aside from "a presence", the other mobs on this island will assist one another in a fight, and since the island is very small, it's impossible to pull a mob without aggroing the other mobs. Pull with caution and be prepared with crowd control. Although it seems safe, do NOT fight inside the windmill. The Blade Storms will attack through the walls but you'll be unable to hit them. 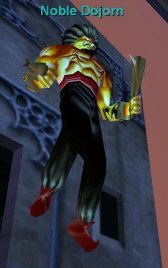 [Confirmed 5/28/2006] Best to fight them outside the windmill on the ledge surrounding it. This island is step 1 of 3 in this cycle. Step 1 is killing Noble Dojorn on this island (who is on a 7 day respawn cycle) which causes the Overseer of Air to spawn on Island 4. Killing the Overseer of Air on Island 4 will cause the Hand of Veeshan to spawn on Island 8. Gwan 1 Near "a presence" No No ?? 57 ?? ?? ?? No Spawn: Hand the Charred Scale (drop from Eejag in Lavastorm Mountains) to "a presence" to spawn Gwan. As the mobs don't see through inviso, just go inviso before arriving, run to the pad and click your way to Island #3. The key loot of interest is called "a broken mirror" and drops 1-3 at a time off of each of "an azarack" and 4 at a time off of the boss mob "Protector of Sky". 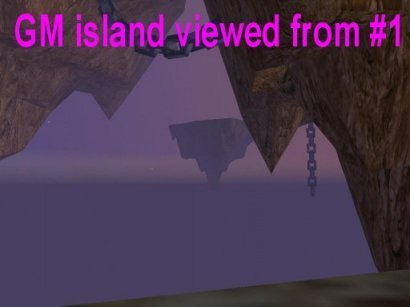 As such, 13-31 total keys may be gotten from this island. 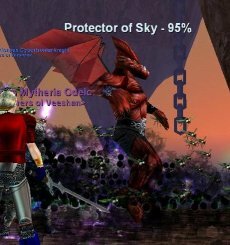 The Protector of Sky used to have a placeholder, but appears no longer to have one. 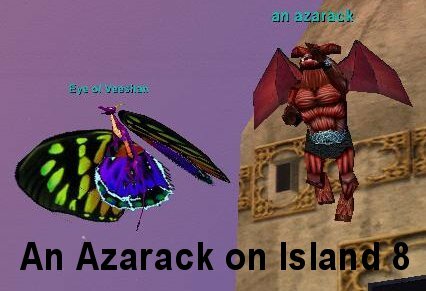 As of May 2006, the only way to spawn the Protector of Sky has been to clear the island of all 9 azaracks. Also, because the mobs do not path close to the arrival point, and because they have a very small assist radius, it has become quite easy to pick them off, one at a time. Because the Protector of Sky appears to no longer have a placeholder, it doesn't seem that aggroing Sirran will be an issue. 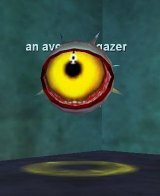 However, if this information is incorrect, remember to make sure that When the Protector of Sky spawns do NOT kill him until all other "an azarack" are dead! Failure to comply with this will mean Sirran will spawn and assist any living "an azarack" and most likely kill your entire raid! However, as mentioned, this seems no longer to be an issue. Anything on Island 4 1 From Island 4 Yes Yes No Depends Depends Depends Depends Not for this island By having a puller gain aggro on Island 4 and jump down to Island 2. Anything on Island 7 1 From Island 7 Yes Yes No Depends Depends Depends Depends Not for this island By having a puller gain aggro on Island 7 and jump down to Island 2. 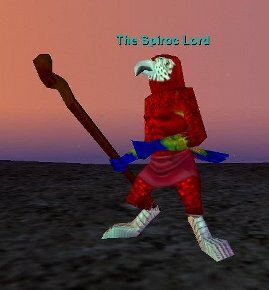 The Spiroc Lord 1 From Island 5 Yes Yes No Depends Depends Depends Depends Not for this island This may be due just to Azarack pathing issues in 2006. Sirran the Lunatic (Island 2 version) 1 Near corpse of "Protector of Sky" No Yes ?? 65 ?? 2054 ?? 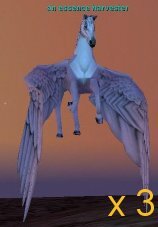 No Spawn: Kill "Protector of Sky"
Safe, but scary looking. Pass through or stay and fight. Mobs galore, some roving, some invisible (be prepared! ), and the boss is here but not re-spawnable without waiting 3 hours. Also, you can get the boss irritated enough to attack you if you talk to him long enough (see "Relevant Conversations", below). As the mobs are non-aggro, and the mobs on the next island are also non-aggro, you can simply pass through without care. The size of the island allows for a safe one-mob-at-a-time farming of keys. Gather your party at the South tip of the island and have your main tank pull the mobs one at a time. Make sure the main tank has See Invisible so that he/she doesn't pull one mob while standing near another invisible mob that will add. Every mob, except the shimmering meteors and pets, will drop key loot. Once your raid has enough key loot, pull the boss mob (Gorgalosk) from the temple. Anything on Island 1.5 1 From Island 1.5 Yes Yes No Depends Depends Depends Depends Not for this island By attacking any of the flying mobs on this island that happen to stray too close to island 1.5. Anything on Island 4 1 From Island 4 Yes Yes No Depends Depends Depends Depends Not for this island By having a puller gain aggro on Island 4 and jump down to Island 3. Sirran the Lunatic (Island 3 version) 1 Near corpse of "Gorgalosk" No Yes ?? 65 ?? 2054 ?? No Spawn: Kill "Gorgalosk"
Gkzzallk 1 Inside Temple No No No 55 ?? ?? ?? 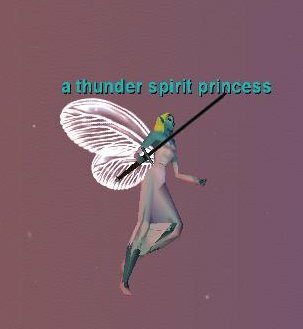 No By giving 10gp to "a thunder spirit princess" on Island 1. 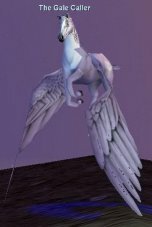 Non-aggressive mobs, pegasi and griffons. Arrive and feel safe, for now. IMPORTANT NOTE: This is the first island where you will encounter CAZIC TOUCH (aka "Death Touch, aka "DT"). Cazic-Touch is a non-resistable (goes through Harmshield and Divine Aura even) 100,000 hp attack. Every mob which uses Cazic Touch in Plane of Sky does so as its first move against any attacker. It will then re-use Cazic Touch every 45 seconds. Be prepared for your puller to die instantly when facing any mob with Cazic Touch. Thankfully, on this island, only the Boss Mob (Keeper of Souls) uses Cazic Touch. As the mobs aren't aggressive, you can just move to the telepad and get ready for Island 5. Since the mobs on Island 5 are aggressive, but do not see through inviso, it's wisest to go invisible on this island before telepadding on to island 5. 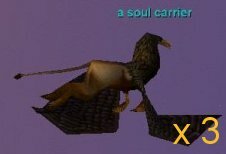 The key loot of interest is called a "Bird Whistle" and drops 4 at a time off of the initial 6 unnamed mobs (3 x "a soul carrier" and 3 x "an essence harvester"). 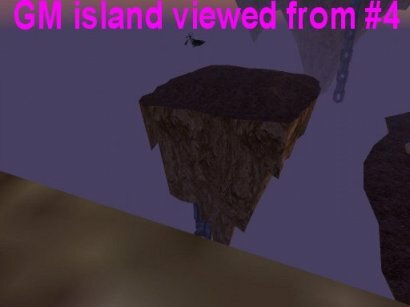 As such, 24 total keys may be gotten from this island. However, this is the first island where you'll encounter SPLIT MOBS. That is, when each mob dies, they will "split" and spawn 1 or 2 more mobs, which are aggressive and ready to fight. Each of the 6 initial unnamed mobs will split into 2 new mobs when they die. When those "2nd level" mobs die, they will spawn 1 more mob each. See the Island 4 map, below, for more detail. That means, for each 1 mob you pull, you'll have 5 mobs to kill. The named mobs do not do this splitting thing, thankfully. This island is step 2 of 3 in this cycle. Step 1 was killing Noble Dojorn on Island 1.5 (who is on a 7 day respawn cycle) which caused the Overseer of Air to spawn on this island. Killing the Overseer of Air on this island will cause the Hand of Veeshan to spawn on Island 8. Note that multiple Overseers of Air can be up at once (due to people killing Noble Dojorn without killing the Overseer, who apparantly has no de-spawn timer). [Confirmed 5/28/2006]. During one visit we had 7 Overseers on track, though visually only two appeared to be at the windmill. Although right on top of one another, they did not appear to assist one another. Our puller took a Death Touch, and then our Main Assist pulled that same mob out and away from the windmill to fight, without any of the other Overseers joining. After one kill, the Hand of Veeshan was confirmed as spawned, and we left the other Overseers (1 or 6, who knows) at the windmill entrance. Because the Boss (Keeper of Souls) is not up when you arrive, you'll need to spawn him. This is fairly straightforward. When any of the three "a soul carrier" or any of the three "an essence harvester" are killed, this will do 2 things. First off, it will start a timer (exact time unknown, but confirmed as low as 65 minutes [Confirmed 5/28/2006]) which, when time is up, will spawn the Keeper of Souls. The 2nd thing that the kill will do is immediatelyspawn a mob known as Ekim Nottap. It is now known to be a FALSE RUMOR that this mob has anything to do with the Keeper of Souls. It is now a confirmed FALSE RUMOR that Ekim Nottap de-spawning causes the Keeper of Souls to spawn. The truth is that Ekim Nottap continues to be on track even after the Keeper of Souls spawns. [Confirmed 5/28/2006]. Careful use of a ranger's tracking skills (Thanks Kilolas!) 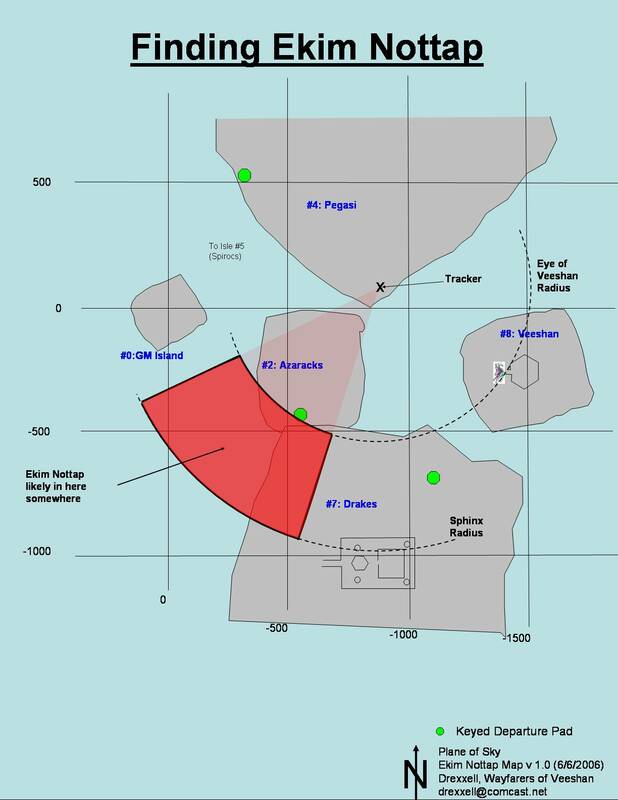 have concluded that if one stands at the very south tip of Island 4, that Ekim Nottap is south and slightly west of that point at about the same distance as Eye of Veeshan (on Island 8). That should put him most likely right around Azarack island (2) or possibly the NW corner of Drake island (7). However, during the time that Ekim Nottap was up and on track and not moving [Confirmed 5/28/2006] I personally went to island 7, and then jumped down to island 2, but never saw him (even with See Inviso), nor did an "F8" check (looking all around) yield any mobs whatsoever. While I was on Azarack, my tracker confirmed that Ekim Nottap was at the same distance and direction as I was, but I never saw him. As such, Ekim Nottap's exact LOC and what he looks like remain a mystery. Ekim Nottap de-spawned much later than when the Keeper of Souls spawned, confirming no correlation between these two events. The exact time of Ekim Nottap's de-spawning isn't known, but he was up at 86 minutes after spawning (well past the spawning of Keeper of Souls), but was gone at 147 minutes. We didn't check for Ekim Nottap between 86 and 147 minutes. Click on the image below to see a map that helps locate Ekim Nottap's most likely location. With all of these elements in place, I pulled an essence harvester, got no adds, jumped from 4 to 3 and after dispatching this mob (and its 4 spawns), we proceeded to clear island 3 (thus killing time on the Keeper of Souls spawn timer). 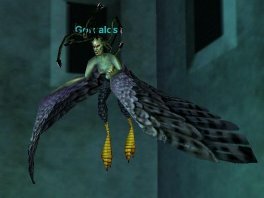 By the time we got done with 3, and up to 4 and began clearing, the Keeper of Souls appeared just as we were pulling the final of the 6 original spawn-split mobs. an essence carrier 6 2 at a time on the corpse of "a soul carrier" Yes Yes No 54 ?? 290 None (Whirl until you Hurl?) No By killing "a soul carrier"
an essence tamer 6 1 at a time on the corpse of "an essence carrier" Yes Yes No 56 ?? 320 Enrage; (Whirl until you Hurl?) No By killing "an essence carrier"
a soul harvester 6 2 at a time on the corpse of "an essence harvester" Yes Yes No 55 ?? 290 None (Whirl until you Hurl?) No By killing "an essence harvester"
a soul tamer 6 1 at a time on the corpse of "a soul harvester" Yes Yes No 56 ?? 320 Enrage; (Whirl until you Hurl?) No By killing "a soul harvester"
Ekim Nottap 1 Unknown, but tracking has shown him somewhere in the vicinity of Island #2, though a trip there while he was up yielded nothing. [Confirmed 5/28/2006] ?? ?? ?? ?? ?? ?? ?? No By killing one of the first 6 unnamed mobs on the island. Sirran the Lunatic (Island 4 version) 1 Near corpse of "Keeper of Souls" No Yes ?? 65 ?? 2054 ?? 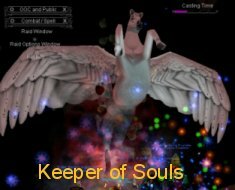 No Spawn: Kill "Keeper of Souls"
AoE DD; proc DD Yes, see below. No By killing "Noble Dojorn" on island 1.5, the Overseer of Air will spawn on Island 4. Inte Akera 1 Inside Windmill Only to evils ?? ?? 53 ?? ?? ?? unknown No By giving 500 pp to Dirkog Steelhand in Quest Room #1a and Inte Akera will spawn. Note that it's almost impossible to do the 500 pp turn in, jump down out of Sky, get back up and get to Island 4 before Inte Akera despawns, so this should really be a team effort. IMPORTANT: The spot marked "pull to here" is a safe spot to stand, visible, without drawing aggro. "Vanquisher alive means trash mobs re-spawn". While this is true, the exact details are not clear. For example, if each Vanquisher has 2 trash mobs (Abriter, Banisher, Caller, Expulsor, Revolter or Walker) associated with it (RUMORED), then killing that one Vanquisher means just those two trash mobs won't re-spawn. But what if the rule is "any Vanquisher alive means any trash mob will re-spawn"?. This definitely needs in field testing. All that can be said for sure is that if all three Vanquishers are dead, there will be no re-spawning of any of the trash mobs. If at least one Spiroc Vanquisher is alive, then The Spiroc Guardian will re-spawn soon after its own death. If The Spiroc Guardian is alive, then The Spiroc Lord will re-spawn soon after its own death. The mobs are aggressive, but do not see invisible. You can just run invisibly to the telepad and click through to island #6. Stay invisible, as Island 6 is also a dangerous island. Although the Boss of this island (The Spiroc Lord) stands right at the telepad to Island 7, don't worry...he doesn't see invisible. The key loot of interest is called a "Noise Maker" and drops 8 at a time off of the three "a spiroc vanquisher". As such, 24 total keys may be gotten from this island. There have been RUMORS galore regarding how the initial pull goes. Rumors of mobs "tied to" other mobs abound. Perhaps the "tied to" portion really only applies to the re-spawn rule and not necessarily to what gets pulled. In fact, evidence in the field indicates that the more likely answer to "how many mobs will I get on my first pull" is impossible to predict. It seems (my theory only) that the mobs simply have a decent sized aggro range, path all over one another (see Map for details), and therefore pulling one mob will always get you at least 5 mobs, possibly as many as 9. You don't need to invoke "mobs tied to each other" to explain a multi-mob pull. Aggro range alone explains it. Using the 3 re-spawn rules listed above, notice that only the Spiroc Vanquishers do not have a "re-spawn upon their death" potential. And, of course, it is the Vanquishers that hold the Key Loot of a Noise Maker. As such, the number of keys this island can yield will be limited (which is like any other island). Farming keys is therefore done by simply pulling the 6 trash mobs and 3 vanquishers, preferably in small bursts, though the initial pull will almost always yield 5-9 mobs. 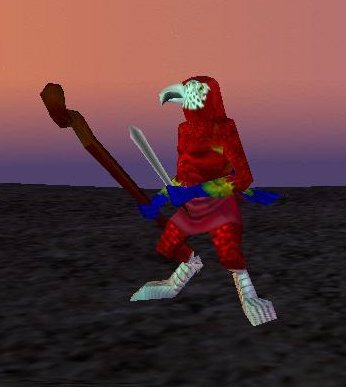 It is sometimes preferred, though not necessarily required, that someone like a Bard or Enchanter be assigned to the Spiroc Lord to keep him from aggroing until the intial 6 trash mobs and 3 Vanquishers are dead. Never, ever, ever under any circumstances kill The Spiroc Guardian. Assign someone to Lull both The Spiroc Lord and The Spiroc Guardian. The last thing you want to do here is aggro them before you've gotten rid of the 6 trash mobs and 3 Vanquishers. Pull the nearest Vanquisher. You'll probably get adds of trash mobs and maybe even other Vanquishers. (Most initial pulls will yield 5-9 mobs). Kill the Vanquishers first. This prevents the trash mobs from re-spawning. Once the initial pull of mobs are dead, continue pulling, always by pulling a Vanquisher. In time, you will have killed all 6 trash mobs, and all 3 Vanquishers, leaving just The Spiroc Guardian and The Spiroc Lord alive. It will be hours before the 6 trash mobs and 3 Vanquishers re-spawn now, so you're ready to farm the boss. Have someone pull The Spiroc Lord, always away from The Spiroc Guardian. Because The Spiroc Lord death touches every 45 seconds, you'll want to kill him fast. Sirran will spawn on top of the corpse of The Spiroc Lord. At almost the same time, The Spiroc Lord will re-appear near the telepad. If The Spiroc Lord did not drop the loot you were after, you'll want to kill him again. Wait for Sirran to de-spawn before pulling The Spiroc Lord again. Try to pull The Spiroc Lord to a spot where you won't gain either Sirran's aggro or the aggro of The Spiroc Guardian. Kill Sirran and then pull The Spiroc Lord. Of the above choices, only #1 is remotely safe. The others carry an emormous amount of risk. Nobody loves waiting 20 minutes for Sirran to de-spawn, but it's better than the alternatives. Note also that this "farming of the boss" only works if you've kept The Spiroc Guardian alive and well so that The Spiroc Lord will continue to re-spawn. a spiroc arbiter 1 On original path Yes Yes No 52 23,000 200 Spells? No By killing "a spiroc arbiter" while either one specific or any one (unchecked) "a spiroc vanquisher" is alive. a spiroc banisher 1 On original path Yes Yes No 52 23,000 200 Spells? No By killing "a spiroc banisher" while either one specific or any one (unchecked) "a spiroc vanquisher" is alive. a spiroc caller 1 On original path Yes Yes No 52 23,000 200 Spells? No By killing "a spiroc caller" while either one specific or any one (unchecked) "a spiroc vanquisher" is alive. a spiroc expulser 1 On original path Yes Yes No 52 23,000 200 Spells? No By killing "a spiroc expulser" while either one specific or any one (unchecked) "a spiroc vanquisher" is alive. a spiroc revolter 1 On original path Yes Yes No 52 23,000 200 Spells? No By killing "a spiroc revolter" while either one specific or any one (unchecked) "a spiroc vanquisher" is alive. a spiroc walker 1 On original path Yes Yes No 52 23,000 200 Spells? No By killing "a spiroc walker" while either one specific or any one (unchecked) "a spiroc vanquisher" is alive. The Spiroc Guardian 1 -870, +769 Yes Yes No 60 23,000? 250 Self Heal No By killing "The Spiroc Guardian" while ANY "a spiroc vanquisher" lives. 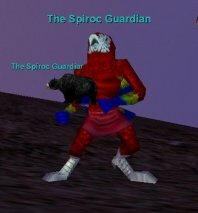 The Spiroc Guardian Pet 1 -870, +769 Yes Yes No ?? ?? 25 "Fantastic Pet Death" No By allowing "The Spiroc Guardian" to cast his pet spell. No By killing "The Spiroc Lord" while "The Spiroc Guardian" lives. Anything on Island 6 1 From Island 6 Yes Yes Depends Depends Depends Depends Depends Not for this island By having a puller gain aggro on Island 6 and jump down to Island 5. Sirran the Lunatic (Island 5 version) 1 Near corpse of "The Spiroc Lord" No Yes ?? 65 ?? 2054 ?? No Spawn: Kill "The Spiroc Lord"
DANGEROUS! You arrive within sight of 3 highly aggressive, large-aggro-range mobs, all of whom split-spawn if you manage to kill one. ALWAYS ARRIVE INVISIBLY AND GET SOUTH OF THE GEAR IMMEDIATELY. IMPORTANT: The large gear embedded in the ground on this island provides sufficient cover for you to be visible and not gain aggro from mobs on the other side of the gear. The mobs are aggressive, but do not see invisible. You can just run invisibly to the telepad and click through to island #7, but if you are not keyed from 7 to 8 you will be stuck on island 7, unable to get the key on 7 to go on to 8. The reason is that the BOSS of island #7 (Sister of the Spire) can only be spawned by talking to the version of Sirran the Lunatic which spawns on island #6 (this island). As such, if you're looking to get keyed from island 7 to island 8, you begin that process here on island #6. The key loot of interest is called a "Dull Dragon Scale" and drops 8 at a time off of the three "Bzzazzt" and 2 at a time off of the boss mob Bazzt Zzzt. As such, 26 total keys may be gotten from this island. The aggro range of each Bzzazzt is huge. The 3 wasps will assist each other unless some form of crowd control is used. 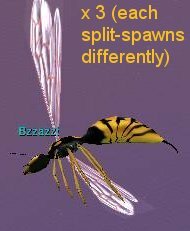 Each of the original 3 wasps (Bzzazzt) drop the Key Loot, but they also split-spawn when killed (see map for details). 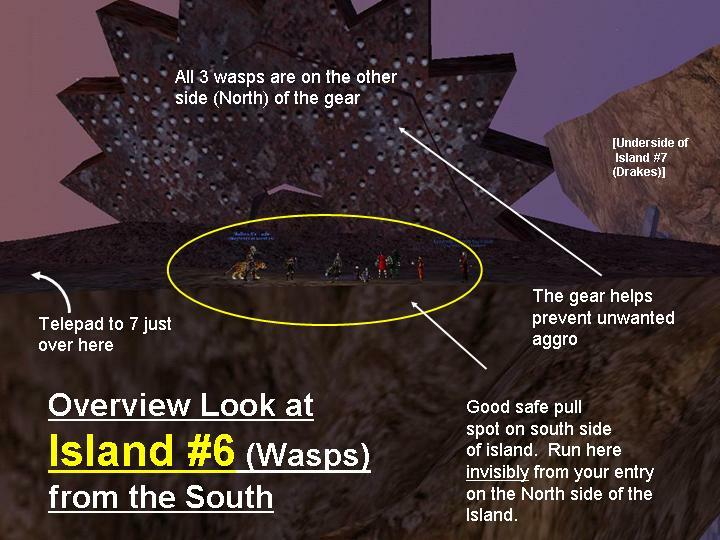 Because none of the other mobs in the split-spawn chain (except the Boss "Bazzt Zzzt") hold key loot, and because this fight will often wipe a raid or last so long that the initial mob corpses rot, it is IMPERATIVE THAT THOSE NEEDING KEYS TO ISLAND 7 LOOT IMMEDIATELY UPON THE DEATH OF THE INITIAL WASPS, "BZZAZZT"! 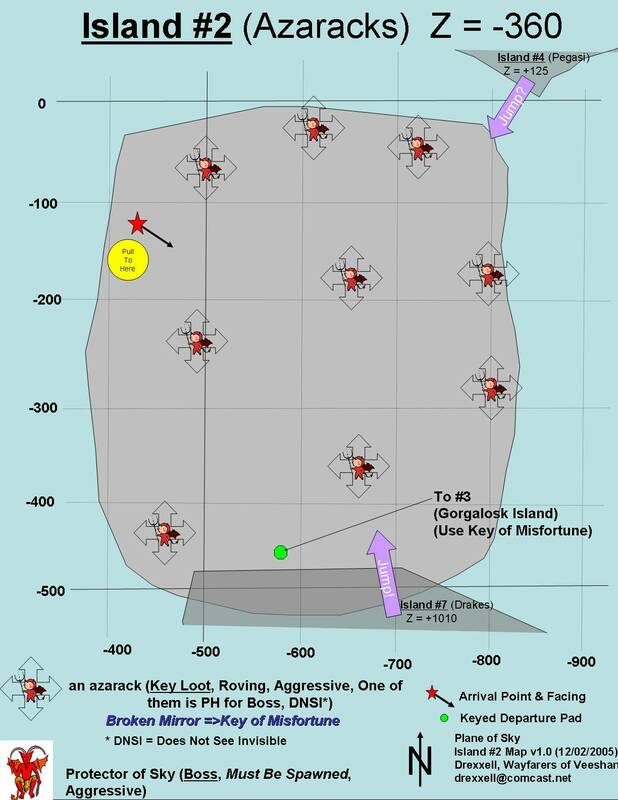 The most successful method of farming keys on Island 6 has been through a three tank method. This method works as follows -- First, assign a SECOND and THIRD tank, of at least 60th level, preferably higher. Also assign a healer to the SECOND tank and assign a healer to the THIRD tank. Then, with most adventurers hiding behind the gear, the MAIN tank peeks his/her head around to be able to see each of the 3 initial wasps. Now, the MT targets Bzzazzt #3 (see map). Then the SECOND TANK does a /assist on the MAIN tank so that they are targeting Bzzazzt #3. The MT then targets Bzzazzt #2 (see map). The THIRD TANK then does a /assist on the Main Tank so that they are targetting Bzzazzt #2. The main tank then targets Bzzazzt #1. At a designated signal, all three tanks engage their targets. The SECOND and THIRD tanks do NOT kill their targets. Their job is strictly to engage and keep them busy. The MAIN tank pulls Bzzazzt #1 back to the rest of the raid for killing (which then sets up the Bazzzazzt x 2 spawn, followed by the Bizazzt spawns.) Once all of these mobs are dead, then the SECOND tank brings their Bzzazzt back to the raid for killing (setting up the Bazzzazzt x 3 spawn). 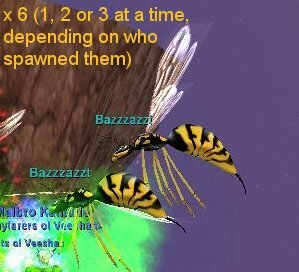 Once these mobs are dead, the THIRD tank brings their Bzzazzt back to the raid, setting up the Bazzzazzt x 1 spawn, then the Bzzzt spawn, and finally the Bazzt Zzzt (BOSS) spawn. 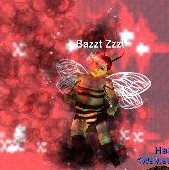 If your tanks accidentally bring back Bzzazzt #3 (you'll know, because when it dies, you'll have only ONE Bazzzazzt spawn), then that tank drags the Bazzzazzt away from the raid to "keep it busy" while the other tanks, one at a time, bring the non-boss-spawning Bzzazzts back to the raid. It should be noted that the Leadership AA "Mark" is a useful tool here, to number the mobs for clarification. Don't forget to loot the Dull Dragon Scale from Bzzazzt immediately upon their deaths. Bazzzazzt (#1) 2 2 at a time on the corpse of "Bzzazzt (#1)" Yes Yes ?? 55 ?? 520 Enrage; Summon? ; Spells? No By killing "Bzzazzt (#1)"
Bazzzazzt (#2) 3 3 at a time on the corpse of "Bzzazzt (#2)" Yes Yes ?? 55 ?? 520 Enrage; Summon? ; Spells? No By killing "Bzzazzt (#2)"
Bazzzazzt (#3) 1 1 at a time on the corpse of "Bzzazzt (#3)" Yes Yes ?? 55 ?? 520 Enrage; Summon? ; Spells? 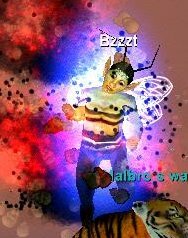 No By killing "Bzzazzt (#3)"
Bizazzt 2 1 at a time on the corpse of "Bazzzazzt (#1)" Yes Yes ?? 57 ?? 600 (700?) Enrage; Summon; Spells: Deadly Poison (100 hp flesh rot) No By killing "Bazzzazzt (#1)"
Bzzzt 1 On the corpse of "Bazzzazzt (#3)" Yes Yes ?? 60 ?? 700 Enrage; Summon; Spells? No By killing "Bazzzazzt (#3)"
Enrage; Rotting Flesh (100 hp AoE); Summons Yes (2) By killing "Bzzzt"
Sirran the Lunatic (Island 6 version) 1 Near corpse of "Bazzt Zzzt" No Yes ?? 65 ?? 2054 ?? No Spawn: Kill "Bazzt Zzzt"
The next-to-last island, and one that will see your raid taking a lot of Death Touches. There are only two aggressive mobs to worry about: Sister of the Spire (in the temple, small aggro range, and only if you've spawned her from Island 6) and The Hand of Veeshan (which is actually on Island #8, but whose aggro is so large that it extends over part of this Island. He will only be up if you've spawned him from Island #4). All other mobs on the island are non-aggressive. Stay away from the temple and the NE quarter of the island and you'll not have to worry about the 2 aggressive mobs. (See Map for details). If you have the key to Island 8 (and congratulations if you do! ), then you need to know if The Hand of Veeshan is up. If he is not up, just run to the NE corner of this island and telepad up to Island 8. Invisibility isn't necessary. If, however, The Hand of Veeshan is up, then you must decide if you're fighting him here (Island 7) or else on Island 8. If you plan to fight him on Island 8, then you'll need to go invisibly to the telepad (since the telepad to Island 8 lies within the aggro range of The Hand of Veeshan up on Island 8. Thus if you go visibly to the telepad, you might draw The Hand of Veeshan down to 7 while you're telepadding your way up to Island 8!). 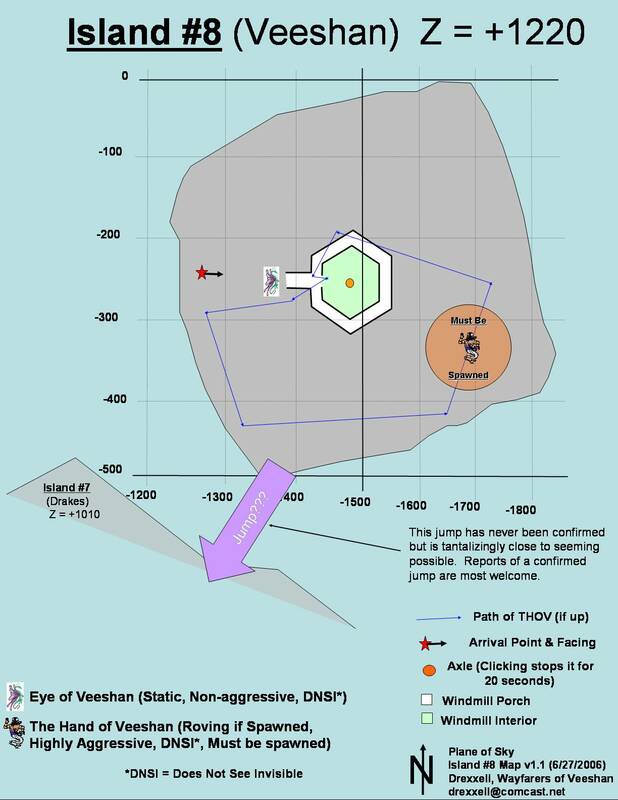 If you intend to draw the Hand of Veeshan down to Island 7, then just move to the NE corner of this island and wait for his attention! First off, if you didn't spawn Sister of the Spire (boss of this island) by going through the motions with Sirran on Island 6 (see Island 6 for details) then you're not going to be farming keys, just key loot. Sirran won't appear without killing the boss and if you didn't already spawn the boss before arriving, you're stuck. Actually, you're not totally stuck. 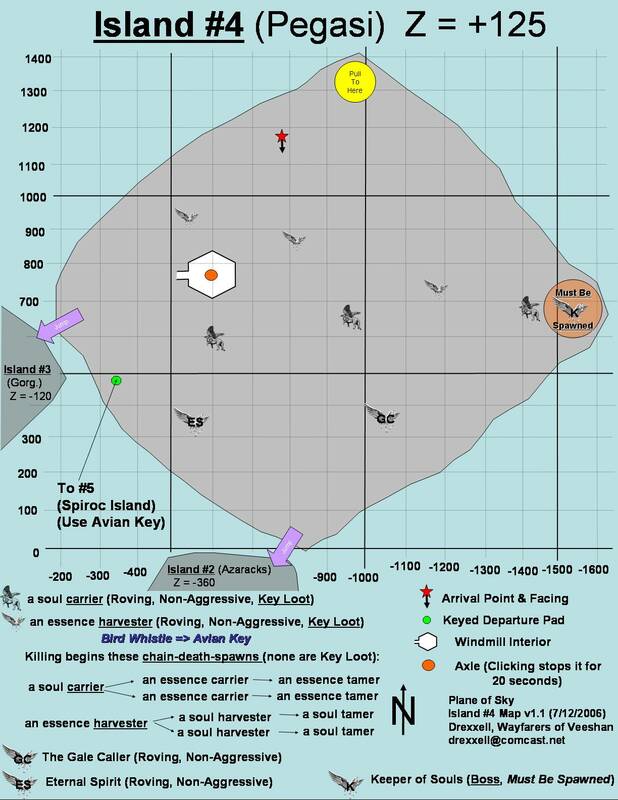 If you've left Sirran alive and well back on Island 6, you can send someone back to Island 6 by having them jump from 7 to 2 (need a way to survive the fall; see Island jumping way above), and then running from 2 up to 6 (need inviso, or at least totally empty islands, plus needing all the keys from 2 to 6). When that person arrives back at 6, they need only say "?llaw eht htiw eno I ma" to Sirran and he'll spawn the Sister of the Spire on Island 7. Assuming, however, that you did spawn Sister of the Spire, then farming keys is relatively straightforward. 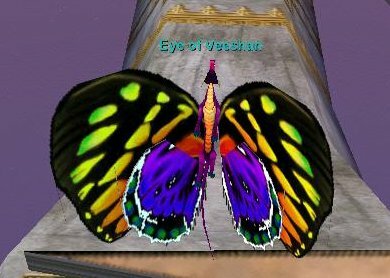 The key loot of interest is called a "Replica of the Wyrm Queen" and drops 1 at a time off of the 15 drakes, 1 at a time off of the 7 sphinxes, and 2 at a time off Sister of the Spire. 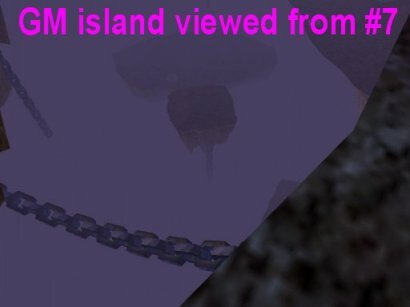 As such, 24 total keys may be gotten from this island. Begin with the drakes, but be prepared for some horrible pathing issues. 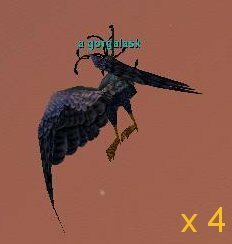 The drakes disappear and re-appear horribly, making the fights a bit out of control, occasionally aggroing the Sphinxes! Take down the outermost drakes first, and move your way inwards carefully. Once you've done the drakes, it's time for the sphinxes. 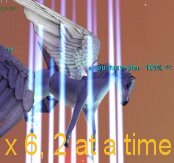 The Sphinxes have Death Touch!!!. This is the first time that a non-Boss mob Death Touches in Plane of Sky. The aggro range of the Sphinxes is tiny, so you can single pull them. As long as you pull them directly away from the Temple you will not gain the aggro of Sister of the Spire either. Each sphinx yields one Replica of the Wyrm Queen. 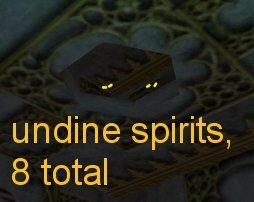 After the sphinxes, you can ignore the Undine Spirits hiding in the temple attic (they don't yield any Key Loot). It's time for the Sister of the Spire. She also Death Touches every 45 seconds. She yields two Replica of the Wyrm Queen. RUMOR: This is another island where the boss can be farmed. 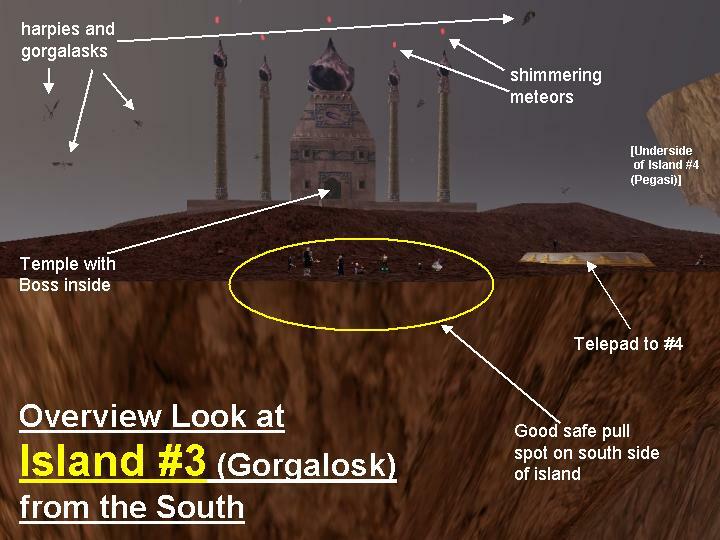 However it requires someone to remain behind on Island 6 (or to jump from 7 to 2 and run back up to 6) and re-speak the phrase "?llaw eht htiw eno I ma" to Sirran on Island 6 to re-spawn the Sister of the Spire. This strategy has not been confirmed (by me directly, but I have reliable reports of it being possible), and seems somehow odd because the death of the boss on Island 7 should spawn Sirran, which means there will be a Sirran on Island 6 and a Sirran on Island 7. Is this possible? Definitely requires testing. A note about the Sphinx/Sister aggro relationship In one raid (5/28/2006) we went out of our way to leave ONE sphinx up (the one near the temple doorway, to the left as you face the Sister). We then pulled the Sister and fought her right outside the temple, very close to the last sphinx. The fight lasted for 2 minutes and 22 seconds. For the first 1 minute and 27 seconds, the sphinx simply sat there and did nothing. Then he deathtouched one member of the raid. In the flurry of battle it was not noticed that the sphinx had aggro'd. 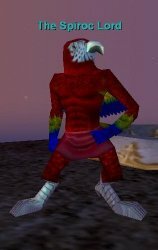 The Drakes on the island never aggro'd at all during the entire fight. Strangely, for the following 55 seconds the sphinx did not do anything aggressive to anyone (no attacking, no spells, and no more DTs, even though its timer had reset). When the Sister died, Sirran arrived and immediately attacked. It would seem that since the drakes hadn't aggro'd, it must have been the attack by the Sphinx that caused Sirran's anger. But why did the sphinx aggro? And why, if aggro'd, did it not continue to appear to be aggressive? All of this remains a bit confusing, but serves as a cautionary note that clearing all mobs before the boss is probably a good idea. ; DD (500) No Aggro: Just get within his aggro range, which is about the NE quarter of Island 7. This only applies if you (or someone else) have already SPAWNED him by killing the Overseer of Air on Island 4. Sirran the Lunatic (Island 7 version) 1 Near corpse of "Sister of the Spire" No Yes ?? 65 ?? 2054 ?? No Spawn: Kill "Sister of the Spire"
AoE Burn (interrupts spells); AoE "Entomb in Ice (1000 DD + stun); Enrage; Summon Yes(2) By saying "?llaw eht htiw eno I ma" to Sirran the Lunatic on Island 6. The final island! Congratulations if you've made it this far. Few people before you have done so. No more keys, no more Sirran. Just Veeshan's own special helpers to be killed. Be wary though! 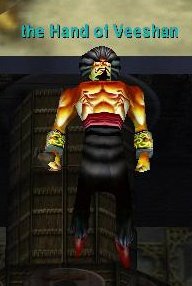 While Eye of Veeshan is always up and non-aggressive, the Hand of Veeshan is highly aggressive, though only up if he's been spawned by killing the Overseer of Air on Island 4. Simple enough, just go visibly to the telepad on Island 7, and gather your forces on Island 8. The view is magnificent, Eye of Veeshan is non-aggressive until attacked. Since both Eye and The Hand have Death Touch, it seems best if you could single pull them, and we confirmed that it's pretty easy. While clearing Island 7, our raid stepped around to the North side of the temple, and the Hand of Veeshan immediately aggro'd, Death Touched a party member, and brought himself down from Island 8 to Island 7. No sphinxes, drakes nor the Sister of the Spire assisted him. Easy as pie. Once he was dead we went back to clearing Island 7 before going up to 8. DD (500) No Spawn: By killing "Overseer of Air" on island 4, The Hand of Veeshan will spawn on Island 8. Aggro: Just get within his aggro range, which includes all of Island 8, the NE quarter of Island 7 and possibly even the SE quarter of Island 4 and the East half of Island 2. 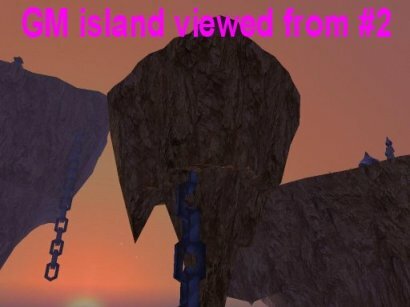 To the left is a picture of our friend "The Hand of Veeshan" flying around his island. (See path information on map). This blade is one of the items needed for Shadowknights to complete their epic. It is a rare drop off of any mob in Plane of Sky. However, if a mob with hands happens to be the one that has it, then their graphic will actually show it in their hands. The pic to the right is an example of spotting the Blade in a mobs hands. Note, however, that the Spiroc Lord can have a blade in his hands but it may be the Spiroc Wingblade (for the Warrior Epic) and not necessarily the Blade of Abrogation. Q: Will aggressive mobs follow someone who has used a telepad to leave their island? A: Maybe, maybe not. 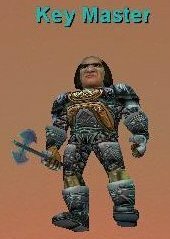 My experience with other "aggro and teleport away" scenarios (predominantly via a Druidic "Evac") would indicate that teleporting within the same zone as the aggro mob will not clear aggro. My only direct experience testing this was rushing across Azarack island while visible and telepadding away to Gorgalosk island. I don't know for sure if the Azaracks actually aggro'd on me though, or if I just got lucky. Either way, I was not followed to Gorgalolsk island. Further testing is warranted. 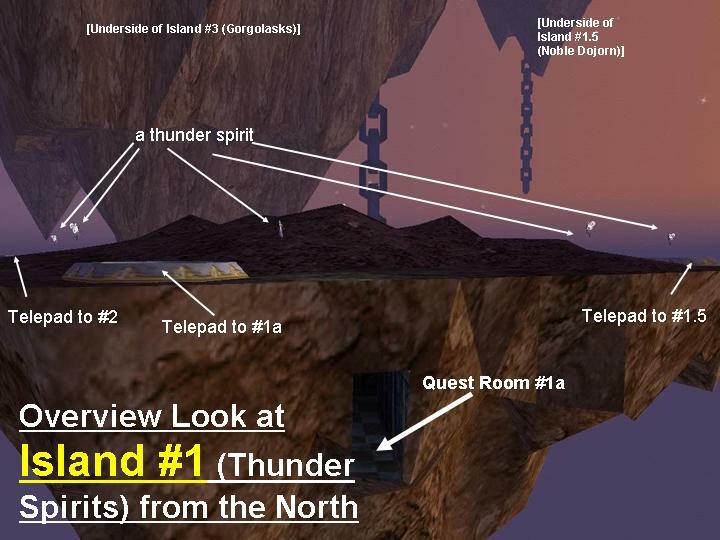 All of the "Plane of Sky Quests"
The picture at right was taken on April 3, 2006. Why is The Spiroc Lord holding a staff? I had no raid force to take him down to find out, but best guess is that he's holding the "Spiroc Battle Staff"
The picture at right was taken on May 28, 2006. How about a 2-weaponed Spiroc Lord? We were just passing through, but best guess is he had the Spiroc Battle Staff and the Spiroc Wingblade both.